We’d love you to check out our timetable! 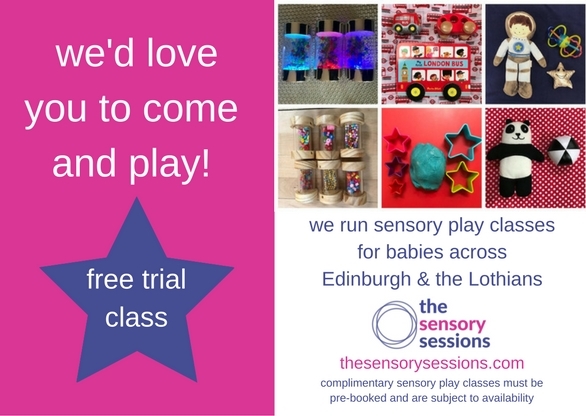 We run our sensory development classes for babies across 13 different locations in Edinburgh and the Lothians, and we have classes every weekday. In addition we also have a sensory development class for toddlers in Leith on a Tuesday morning. This class is suitable for children from 1 to 3 years old. Our summer term runs from April 22nd 2019 to 28th June 2019. Our classes run all over Edinburgh, the Lothians and are coming soon to Fife! If it is your first time with us, you are really welcome to join us for a complimentary trial so you can try our sessions for yourself. Complimentary trials are booked through our booking site. to see our class times visit our booking site! Our classes are split into two stages, from birth to sitting and from sitting to the age of one, and we are able to move your little one up a class during the term subject to spaces available. If there is a waiting list for the class of your choice, please do register for it as we’ll be in touch to offer you a place or an alternative as soon as one is available. Do get in touch if you need any booking assistance or information on our sessions.